Yes, it’s a good thing that the debate about the possibility of buying the F-35B has ‘opened up ’. But that’s simply because it’s good to talk. Politics will prevent it from maturing beyond a completely academic argument. Of course it’s a good idea. Of course it would be nice to have a vessel capable of providing integral air support to an amphibious group. But it’s just not going to happen. And why? Welcome to the world of defence funding. There are two problems with the idea of converting one of these ships to operate as a mini-aircraft-carrier. The first, probably insuperable problem is that it would cost a great deal to strengthen the flight deck and convert one of the vessels to carry the STOVL  version. But even if that can be achieved and the money found somewhere, you still have the second predicament: opportunity cost. Using one of our two LHDs to provide intimate air-cover for a task force sounds great, but it’d drastically cut the number of troops carried—and that’s the whole idea of the vessels. It would also halve operational flexibility (by restricting landings to simply one beachhead). The idea of converting one of our purpose-built Landing Helicopter Docks into a pathetically small and inefficient aircraft carrier, rather than using it to do the job it was bought for, just doesn’t make sense. There’s another alternative, of course. If we wanted to operate a small air detachment, we could buy a third LHD. That one could be specifically designed to operate the F-35B and would provide all the good things that come with such vessels. But pause to think for a moment and you’ll realise why that won’t happen either. For a start, you’d need a new version of the aircraft and another, different, type of ship. Neither of those bits of equipment would quite be orphans, but they wouldn’t be part of the existing family either. Effectively we’d be asking the taxpayer to pay for the acquisition of a new capacity. The last time we had a real carrier was almost 50 years ago. It would have to line up in the list of budget priorities and fight against all the other spending demands. I can hear the questions now: So we’re not at war, you can’t tell me what this capacity is for, or who we’d be operating against—you just think it might come in handy? Nice try, but we’ll have a hospital/tax cut instead, thanks. Put yourself in a politician’s shoes. What are you going to buy—a third LHD in case we need to provide air cover tomorrow or a hospital to serve one of today’s quick-growing marginal electorates? I know where I’d spend my money. John Howard’s government was urged by some to consider the possibility of a third LHD when it made the original decision. It chose instead to retain an option to build a fourth AWD. But the economic environment has changed. The government’s commitment to return to spending 2% of GDP (at some unspecified date in the future) does indicate a willingness to spend on the military. However that doesn’t mean it’ll choose to prioritise a new capability such as this in the future—particularly when it’s suffering such political grief for cutting allowances today. In the Middle East, our Super Hornet pilots regularly operate on missions of more than 10 hours, topping up their aircraft once or even twice from the terrific KC-30A multi-role tankers of 35 Squadron. Operating out of Al Minhad wouldn’t be anyone’s first choice. Perhaps you might like to ask the government why we can’t fly our aircraft from Iraq. Actually, perhaps not. That opens up a whole can of worms that nobody’s keen to address. The point is, it’s a long flight, but the pilots cope. There’s a case for the F-35B but it has nothing to do with ships. What’s missing from this discussion is the increasing lethality and destructiveness of long-range missiles. The problem with the conventional version of the aircraft is that it requires a runway to take off from. That restricts its operations to locations with airstrips. But today’s long-range missiles are deadly accurate. They might miss the JSFs, but they wouldn’t need to be tipped with nuclear devices to destroy the tarmac (or at least damage it enough to severely inhibit operations). The very trends in increasing missile accuracy that militate against the acquisition of any sort of carrier are also, over time, likely to have an inhibiting effect on where aircraft can be deployed. Missile range is increasing as costs decrease. It’s possible to make an argument for purchasing the F-35B along those lines by stressing their utility in forward operational areas. Still, I can’t help feeling that cost considerations will also consign that option to the same dustbin as the aircraft-carrier. There was, I believe, a good argument to be made for incorporating the STOVL version as a part of our original purchase of aircraft. That chance has gone. 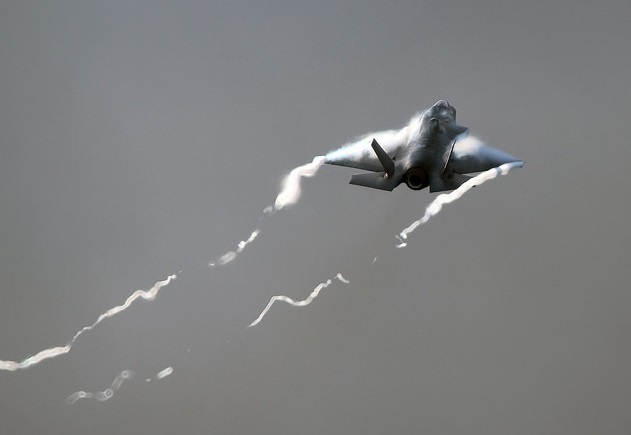 Finding the extra money needed to buy, operate and maintain the F-35B will now be impossible. Nic Stuart is a columnist with The Canberra Times. Edited image courtesy of Flickr user UK Ministry of Defence .